Ammolite is an opal-like organic gemstone found primarily along the eastern slopes of the Rocky Mountains of North America. 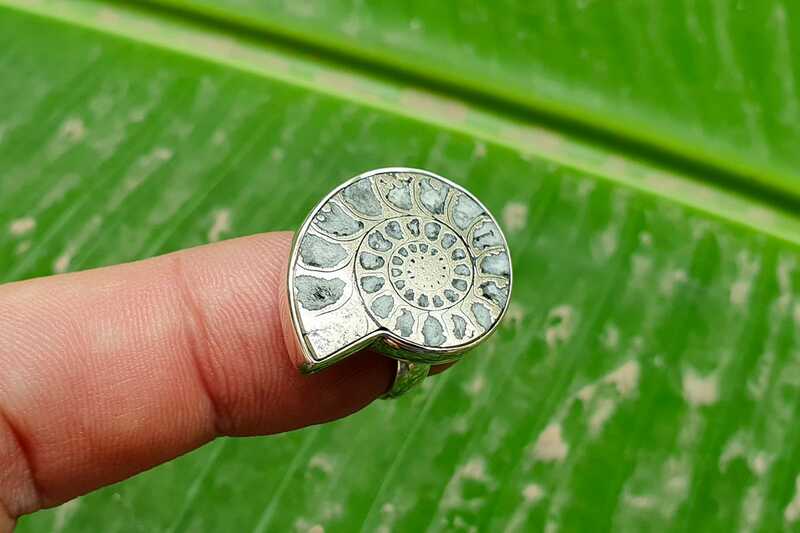 It is made of the fossilized shells of ammonites, which in turn are composed primarily of aragonite, the same mineral contained in nacre, with a microstructure inherited from the shell. It is one of few biogenic gemstones, others include amber and pearl.1 In 1981, ammolite was given official gemstone status by the World Jewellery Confederation, the same year commercial mining of ammolite began. It was designated the official gemstone of the City of Lethbridge, Alberta in 2007. Ammolite is also known as aapoak, gem ammonite, calcentine, and Korite. The latter is a trade name given to the gemstone by the Alberta-based mining company Korite. Marcel Charbonneau and his business partner Mike Berisoff were the first to create commercial doublets of the gem in 1967. They went on to form Ammolite Minerals Ltd. The chemical composition of ammolite is variable, and aside from aragonite may include calcite, silica, pyrite, or other minerals. The shell itself may contain a number of trace elements, including: aluminium, barium, chromium, copper, iron, magnesium, manganese, strontium, titanium, and vanadium. Its crystallography is orthorhombic. Its hardness is 3.5–4.5, and its specific gravity is 2.60–2.85. The refractive index of Canadian material, as measured via sodium light, 589.3 nm, is as follows: α 1.522, β 1.672–1.673, γ 1.676–1.679, biaxial negative. Under ultraviolet light, ammolite may fluoresce a mustard yellow. An iridescent opal-like play of color is shown in fine specimens, mostly in shades of green and red, all the spectral colors are possible, however. The iridescence is due to the microstructure of the aragonite: unlike most other gems, whose colors come from light absorption, the iridescent color of ammolite comes from interference with the light that rebounds from stacked layers of thin platelets that make up the aragonite. The thicker the layers, the more reds and greens are produced, the thinner the layers, the more blues and violets predominate. Reds and greens are the most commonly seen colors, owing to the greater fragility of the finer layers responsible for the blues. When freshly quarried, these colors are not especially dramatic, the material requires polishing and possibly other treatments in order to reveal the colors full potential. Ammolite comes from the fossil shells of the Upper Cretaceous disk-shaped ammonites Placenticeras meeki and Placenticeras intercalare, and, to a lesser degree, the cylindrical baculite, Baculites compressus. Ammonites were cephalopods, that thrived in tropical seas until becoming extinct along with the dinosaurs at the end of the Mesozoic era.